I always used to consider subscribing to a beauty subscription service, but with so many different companies in the market, I have to admit, I felt overwhelmed for choice. However, after doing a lot of research I decided in October 2016 to subscribe to Birchbox - the UK's No 1 Beauty Box. When subscribing to Birchbox you are required to fill out a beauty profile so that every month the products which are sent to you are tailored to your beauty needs. It's really easy to set up your profile, and once it's done you just need to sit tight and await your box with anticipation of what surprises are in store for you each month! You can change your beauty profile at any time if your requirements change; again it's really easy to make these changes. At the time of writing this post, my Birchbox landed on my doorstep only a couple of hours ago! 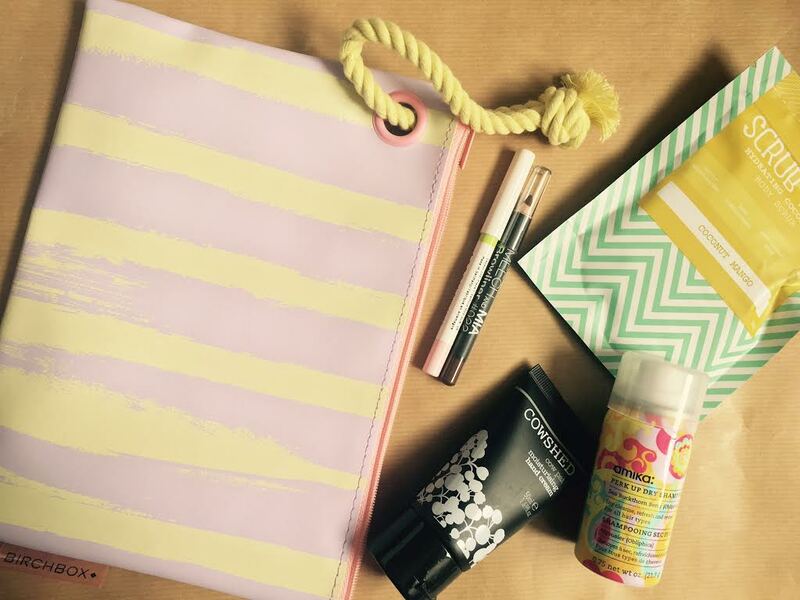 June's Birchbox is very summery themed, and rather than the products being in a box, this month they are stored in a lovely looking bag which will be perfect for a summer holiday! There was a choice between two colours, a yellow striped or mint striped bag. I got an email a couple of weeks ago from Birchbox enquiring which colour bag I would prefer and I chose to be surprised with either bag. I received the yellow striped bag, and I really love it! It will definitely be well used. Inside the bag are five items, two are full size items and the other three are sample sizes. The two full size items I received were the MeechNMia Brow Liner and Cowshed's Cow Pat Hand Cream. Hand cream is always well received by me because I always tend to get dry skin on my hands. The other products I received are the Arrow Enhance Waterproof Eyeliner in Bright Now, Scrub Love Coffee Body Scrub and Amika Perk Up Dry Shampoo. What I really like about Birchbox is that every month I have an opportunity to try brands and products that I would never have considered trying before, and it opens my eyes up to what's available in the beauty market. The cost of a Birchbox subscription is only £12.95 a month which I feel is worth it considering you get two full size beauty products and three samples every month, and of course the boxes, or bags, which the products come in, are re-usable. I'm really looking forward to discovering what else I receive from Birchbox in the coming months!